Last week, it was reported that Volkswagen and the U.S. Justice Department were nearing agreement on a plea deal to settle criminal charges against the automaker and its executives for their role in the dirty diesel scandal. This week, the government applied a little pressure, arresting a VW executive who headed the company's regulatory compliance office in the U.S. in 2014 and early 2015, acording to a New York Times report. The newspaper said Oliver Schmidt was arrested by FBI agents in Florida and flown to Detroit for arraignment today. Lawsuits filed against Volkswagen have named Schmidt as a key player in the automaker's attempts to conceal its emissions cheating from regulators. Last week, a South Korean VW executive was sentenced to one year and six months in prison for falsifying emissions and noise pollution documents. The German automaker has already agreed to pay $15 billion in fines and reimbursements to consumers. It is expected to agree to pay another $2 billion or so in the negotiations now underway with the Justice Department. 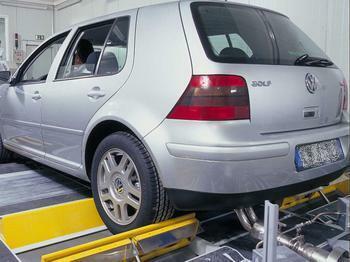 After initially denying any wrongdoing, VW admitted in September 2015 that it had used illegal "defeat devices" in nearly half a million 2.0-liter diesel cars to cheat emissions tests and make the car appear to be operating legally when in fact they emitted up to 40 times the legally allowed levels of pollution. VW admitted in September 2015 to installing secret software known as "defeat devices" in 475,000 U.S. 2.0-liter diesel cars to cheat exhaust emissions tests and make them appear cleaner in testing. In reality, the vehicles emitted up to 40 times the legally allowable pollution levels. Automotive News, a trade publication, noted today that Volkswagen executives are not attending the Detroit Auto Show, normally a command performance for all automakers.